It happened 14 years ago but Jhuma Ghosh from 24 Parganas in West Bengal cannot forget it. After her husband decided to leave his job with India’s defence forces, she had decided to start a small retail store near their home. With a son and daughter to take care of, Jhuma now thanks her stars that she actually took the step and moved ahead with her plan. Called ‘Jhuma Stores,’ it is a modest retail outlet that sells stationery, cosmetics and some eating and drinking (E&D) products that add to the footfall for their business. Their earlier shop, selling puffed rice, among other things, gave way to something that had a wider array of options. A few years after her husband decided to leave the job with the Indian Army in 1999, Jhuma managed to convert it to the bigger retail store to add to the family income. Of the 14 years she has been running her small business, registered in her own name, she has been selling Coca-Cola for 12 years. A few years ago, help poured in from unexpected quarters. “A team of officials of Coca-Cola and the local municipal corporation explained the importance of keeping our shop clean and ensuring the best hygiene standards. It was good that I attended the programme,” Jhuma said on phone in her mother tongue, Bengali. She enjoyed the training, and the practical lessons that it came with so much, that she has attended it several times now. Since part of her small business also has an E&D section, the input she got at the training session has raised the standards. Thousands of kilometres away at Gurdev Nagar in Ludhiana, Punjab a small E&D outlet has caught the attention of its customers because of small, but noticeable, changes it has brought about in its business. In late 2017, Harish Kumar attended a similar training session in his city where he was told several important points to keep in mind while running his small business. Among them was the importance of wearing gloves and cap while serving his customers at Krishna Kulcha Hut. In Punjab, kulcha is often part of traditional food. It is often sold in pushcarts and since Harish is now very particular about cleanliness and hygiene, he has often heard customers talk about it, while complimenting the effort. All the waste generated by his E&D outlet goes into dustbins while cleanliness is an essential part of his business. “The training was held at a hotel in Ludhiana. Along with Coca-Cola’s team members, there were some people from the local municipality too. At the end of the training, we got a certificate too, which is displayed”, Harish says. Nine years after he started the E&D business, Harish is happy that his customers can now see more value in the offering that he has for them. With four members of the family, including his mother to take care of, he may have just taken the right decision in the long-term interest of his small business. Helping transform small E&D businesses has been a community effort that Coca-Cola has been diligently working on for several years. In March 2017, Coca-Cola signed a memorandum of understanding (MoU) with Food Safety and Standards Authority of India (FSSAI) to develop a joint curriculum specifically for small food establishments. As the first company to partner with FSSAI, Coca-Cola has set itself a target of training 50,000 small food vendors in food safety and hygiene. The ‘Parivartan,’ (which translates to ‘change’) programme uses a mix of training methodologies like inventory, working capital and customer relationship management, and others to upskill small retailers. A three-hour programme in vernacular languages is carried out through FSSAI-certified trainers. These are held in classrooms as well as aboard a bus that has been converted into a mobile classroom, which travels across the country. Each ‘classroom on wheels’ can carry out up to three sessions in a day for nearly 25 students. 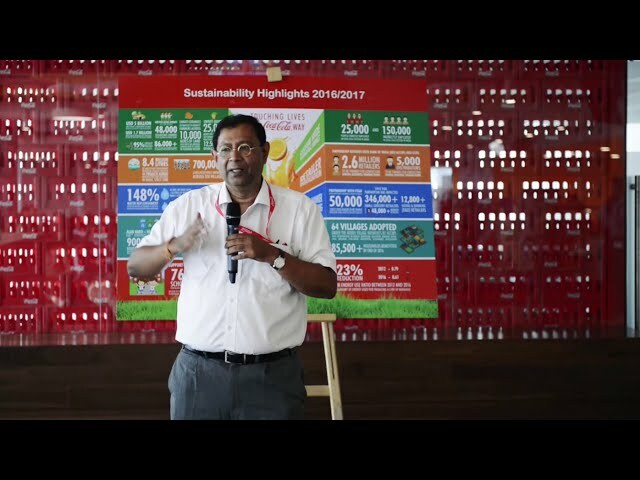 The effort of the ‘Parivartan’ programme also found a mention in the Sustainability Update 2016-17, an annual update of the CSR and sustainability activities of Coca-Cola in India. According to the report, 12,800 E&D retailers have already been trained. Since 2008, when Coca-Cola started its effort to upskill micro-entrepreneurs, Parivartan has impacted over 346,000 small grocery retailers, including over 48,000 women retailers. “We are trying to reach out to thousands of retailers across India and help them upskill to offer better products and services to their customers. Nearly a year after the programme was started, we are beginning to see encouraging results, which has encouraged us further,” says Anurag Anand, who heads the franchise capability services for Coca-Cola in India. As the ‘Parivartan’ team realised, ‘small’ is a big opportunity. The smaller vendors that they have been able to impact and help change for the better, the more there seems to do. Little wonder, there are stories of upskilling small street food vendors from across the country. A modest burger selling outlet at Ludhiana’s Suhani Building Chowk, just about half a kilometre from the bustling city’s railway station. It could easily be indistinguishable from one of the many in the city. But Rohit Burger Point stands out at it offers burgers to customers queuing up at its counters. Cleanliness is paramount and the customers can see that around. “Customers have told us several times that, compared to other places, we keep it very clean. That is one reason why they love coming back to us,” Rahul Kumar, who runs the E&D outlet, says. The ‘Parivartan’ training he too attended in his city was one of the turning points for his fledgling business. While the basics of business were focused upon, Rahul recalls being told about how the raw materials that are used must be of good quality. “We were told ‘Once people get used to that, they will come back again and again’ and I can see that happening,” Rahul said. At his E&D outlet, he proudly displays the certificate he received after going through the training. From Kolkata, the Biswas couple have also had a similar story of learning to share. With their small E&D outlet, Biswas & Company, the couple have been in business for the last 20 years. The Indian Ordnance Factory in which Kamal Biswas worked had shut down in 1998 and he had lost his job. Since then, the couple started their own small business, and with the Calcutta Boys’ School right opposite their outlet at Taltala, Kolkata, they have not had to struggle too much for customers. In chaste Bengali, Kamal Biswas explained how he loved being part of the ‘Parivartan’ training programme. “I have attended the programme on several occasions when it has been held and want to go again because every time I get to learn something new,” he said. The shop opens before the school begins at 8 am. Parents who come to pick up and drop their kids and the school children are his regular customers. When he wanted to present a clean place for them for a snack and beverage, the learning during ‘Parivartan’ have always came in handy. His family had been running an electrical goods retailing business, set up by his father in 1974, and he always understood the pulse of the people. “The training helped us to improve and give people exactly what they wanted,” he now says. As small businesses grow, a perfect recipe could be in the works – cleanliness, customer focus and offering the customers what they are looking for!